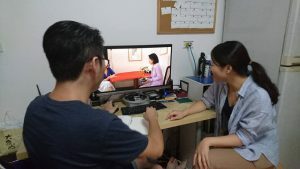 We filmed part of our film Love Ghost in the spring and now we are busy editing. Our composer Anton Botes will create music for the film. Our team has actors and film crew members from Sweden, Taiwan, the USA and Italy. Happy and proud to be part of this Nordic-Taiwanese-International film collaboration. Please follow us on facebook and twitter at @LoveGhostFilm !